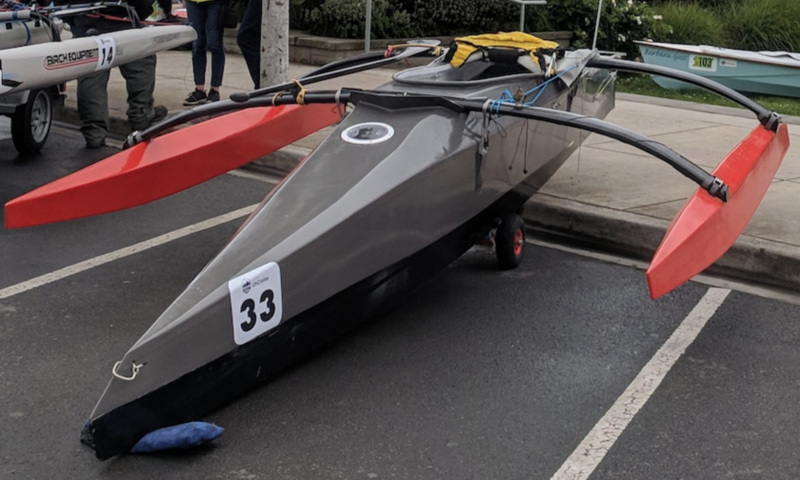 An interesting aspect of helping Matt build his Race to Alaska boat is learning from him, the boat designer Rick Willoughby, and other contributors how important aero- and hydrodynamics are to creating an efficient boat. When you can only provide ~250 watts of propulsion power (or 500 in Matt’s case), rather than the normal 3600 watts you get from a 5 hp outboard, you need to minimize drag in order to attain admirable boat speeds. Matt’s boat is version 16 of a pedal boat designed by Rick. This V16 R2AK is modified for the Race to Alaska in many ways, but one key one is the canting daggerboards. These foils are designed to be elevated above the waterline so that Matt can pedal without any water drag from them, and then lowered during sailing to to provide lateral resistance and lift that helps keep the boat from heeling. When lowered to the maximum angle of about 55 degrees below horizontal, the leeward daggerboard will help with upwind performance. On a reach it could be raised to provide more lift, while on a run it can again be pulled up clear of the water. Here are some photos of the dagger boards — both during construction and initial sea trials. 10 cm 4oz glass tape reinforces area where strut will be through-bolted. Over-drilled holes filled with epoxy-silica mix. The hinge that will hold the dagger board at the ama (aka stabilizer). The hardware that will create a pivot point where the strut joins the middle of the board. Checking clearance of the hinge which is designed to have leading edge break away from hinge in a collision and pivot backwards. Luckily I didn’t have to bevel the trailing upper corner as there was no conflict with the hinge pivot nuts. First coat of white glossy Rustoleum going on. We used fender washers to spread the strut loads out over both the epoxy-silica bushing and the surrounding fiberglass. The strut attached (but not yet faired) as we adjusted it’s length to get the maximum possilble down angle, but still be able to raise the board clear of the water. We ended up deciding to shorten the struts from about 63 cm to 58.5 cm LOA. This allows the struts to come up above the water line (and hopefully many of the smaller waves) and be lowered down to near 55 degrees below horizontal. It was clear during testing in the lake that the bare aluminum struts were creating a LOT of drag. Rick explained that fairing them (with a symmetrical foil shape) would reduce the drag by about a factor of 20. Sailing with them immersed was equivalent to pulling a second Rouleur hull behind us! Here are a few more photos of the fairing of a second set of struts (made with slightly thicker walled aluminum tubing, too, I think). This set was faired with cedar, though we may fair the original tube with foam insulation to have a backup (lighter duty) second pair. Rick’s clamp that allows the strut to be set at different heights. The jaw is tightened by turning the eye-nut by hand. Matt checking lenths and angles. Scott’s method of rounding out the cedar to accepte the sanded rough aluminum tubing. This is the foil cross-section we’re after. Carefully glued up (late at night without enough thought regarding how these are to be pivoted). Staring the carving of the cedar (with hand plane, surform, and then sand paper. Fairing the low points adjacent to the tube. The foils after final sanding. Preparing to glass with ~4oz cloth. Cora was a great help wetting out with System Three Silvertip. The astute reader will notice that I drilled the holes 90 degrees off in the ends of the struts! This was remedied by re-squeezing the ends (I did this in the vice already without cracking any epoxy, thankfully) and re-drilling (much easier to line up the holes when you’ve got the faired foil shape behind the bit in the drill press!). Any strength lost from the initial errant holes I hope to regain by injecting silica-epoxy plugs 2-3 cm into the tube ends.